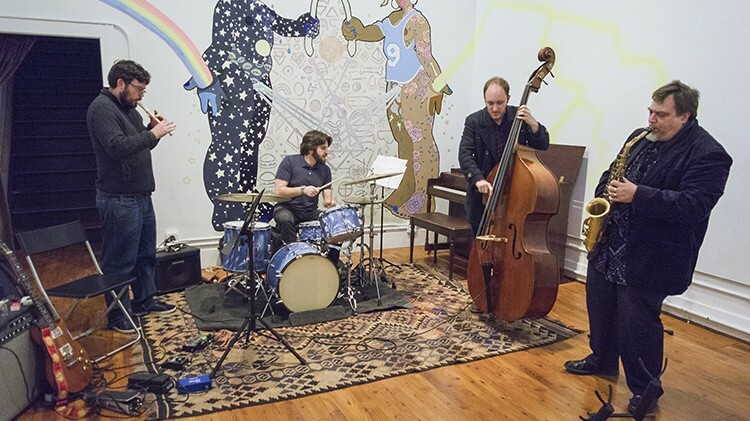 Guitarist Ben Westfall (on recorder), drummer Aaron Levin, bassist Leo Lober-Tracy, and saxophonist Rent Romus improvised a quick set before an Oakland Freedom Jazz Society show at Studio Grand on Jan. 22. Some of the wildest, most progressive and talented sonic experimentation in the Bay Area happens on a Monday night. At the music series Oakland Freedom Jazz Society, players bring guitars, percussion, and homemade synthesizers to Studio Grand and create a cacophony of sounds in "free music": modern and experimental jazz, noise, and improvisation. "I think it's one of the most thrilling things that's going on in the Bay Area right now and no one is talking about it," said OFJS founder and curator Fernando Carpenter. OFJS will celebrate its fifth anniversary on Sunday, Jan. 28, with a day-long concert featuring more than two dozen musicians, several of whom will play in projects created specifically for the event. OFJS was born out of necessity: The Bay Area has a rich history of jazz and experiential sounds but, as tastes change and rents soar, very few places for those musicians to play. Carpenter, who co-owns VAMP Records and curates music at his shop and venues around town, envisioned an event where local musicians could improvise, experiment, and hone their "head music" in a public space. "When I started, I didn't realize that there was a lack of stages that allowed this kind of music; a lot of it was very underground, a lot of it was played in people's living rooms," he said in an interview. "I saw it as sophisticated and very engaging. For someone who listens to music every day because of my job, it just kind of satisfied my eardrums for the new and exciting." With help from artist Leora Lutz, veteran players Aram Shelton, Lisa Mezzacappa, Darren Johnston, Ben Goldberg, and Vijay Anderson, the series took root at The Layover on a Monday night — typically the worst night of the week for bars and restaurants. Carpenter thought that hosting an experimental series during a night with low revenue expectations would be the perfect venue for music that can often seem complex or specifically oriented toward other musicians. OFJS started with a smaller cast of musicians who would play in three or four different projects. Each project typically had a leader who would compose material or have a musical idea that other players would improvise on. OFJS attendees would never see the same show twice. "What I encouraged people to do was risk-taking, trying new things, sticking your neck out. I'd create a comfortable arena to truly experiment and it was OK to fall on your face," Carpenter said. "Musicians would hone their ideas here in the series and then would share it in New York, Berlin, and play to larger audiences." One week might showcase a modern jazz trio, while the following week would feature a unique combination of a banjo and a sitar player. Musicians sometimes play handmade instruments, others perform on homemade modular synthesizers, and some will play their instruments in unique ways, taking off mouthpieces to create droning sounds. "This music series is very open-minded, and I don't see this kind of series outside of Bay Area much," said Nava Dunkelman, a series regular who performs in an electro-percussion experimental noise duo called IMA and the improvisational duo DunkelpeK. "There's always been a feeling of experimentation, trying new things, and in some communities, there's been emphasis on doing something wacky," said longtime clarinetist and composer Ben Goldberg. "Fernando is not trying to book music that is what most people would consider commercially viable.... He runs the series as if music matters." After a year at The Layover, OFJS moved to Duende, VAMP, and Spice Monkey before finding a home at Studio Grand about two years ago. Studio Grand's "listening room" atmosphere allows audiences and musicians to engage deeply, without much conversation or clinking of bar glasses in the background. "In my 30 years here, I have seen the number of jazz clubs in the greater Bay Area dwindle to a mere handful of venues," said Myles Boison, a lifelong musician who plays guitar, banjo and bass. "And many of these spots have restrictive booking policies that only include the established traditions of jazz music — nothing newer than the fusion sound of the 1980s. [OFJS] is definitely unique in that the musicians get to present their most personal, and often most challenging, musical ideas, free of commercial considerations or any kind of artistic restrictions." OFJS has hosted more than 300 shows and roughly 40 groups, which feature established musicians as well as up-and-coming players. The series has a low bar to entry and Carpenter will book anyone with interest and a reference. Yet OFJS is anything but an amateur hour; the series has been host to free jazz, avant-garde, and noise percussionist William Winant, who has worked with Sonic Youth and Thurston Moore, and legendary multi-instrumentalist, composer, and improviser Fred Frith, who has collaborated with Brian Eno in addition to playing guitar in a number of art rock projects. Both Frith and Winant will perform at the anniversary show. "There are these people who live in the Bay Area that you never really see, then all of a sudden you're staring at them and they're playing amazing music in front of you," musician and composer Aram Shelton said from his home in Copenhagen. "To be able to see Idris Ackamoor of [world music/jazz ensemble] The Pyramids play a set on that series was really cool. It reminds you that there's a lot of special talent and there just needs to be the right venue for them to play." Although San Francisco venues such as the Luggage Store Gallery, Center for New Music, and The Lab regularly showcase experimental music, OFJS offers a unique opportunity to tap the talent at Mills College and its Center for Contemporary Music. The center houses early versions of analog synthesizers, which represent a growing portion of OFJS's musical accompaniment, and many of the series' musicians attended or teach at Mills. Although he will host players from out of town, Carpenter said his priority is giving East Bay and Bay Area musicians a place to perform, while acting as a sort of torchbearer for the free music movement. "This music is made by people who are devoting their lives to finding a way to do this thing and do it well; there's a great deal of sincerity involved," Goldberg said. "We really need people like Fernando. The way he just stands by the musicians and presents the music with so much respect and belief is a remarkable thing. If there wasn't Fernando, then there wouldn't be nearly as many opportunities for audiences and musicians to come together the way we need to." Carpenter said he hopes to host 1,000 shows before passing the torch along.